From its majestic, Verdant Mountain peaks to its serene, sandy coves; Saint Lucia seems naturally inclined to inspire romance. So it’s no wonder that the producers of the TV show “The Bachelor” chose the island as the setting for its final episode. What better place to declare your love than on its singularly pristine shores, fronted by a brilliant blue horizon? 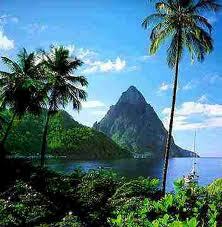 Saint Lucia owes much of its romantic appeal to its terrain: exotic, striking and uniquely picturesque. The scenery of its Piton Mountains, rising to a height of 2,500 ft. and plummeting directly down into the Caribbean Sea, awes even travelers familiar with the Caribbean. The Island’s coastline is equal to its inland landscape in both diversity and uniqueness. Saint Lucia’s beaches rank among the best in the world, with Jalousie Beach’s location between the Pitons making it a favorite for honeymooners. Anse Castanet’s curved cove is lined with palm trees, and features a coral reef that makes it ideal for both sunning and snorkeling. And at the north end of the island, Pigeon Island National Park’s beach is often uncrowned, but no less scenic. All beaches in Saint Lucia are public, so couples are free to explore and find their own private place in the sun. One popular honeymoon upgrade is a tour of the beaches on horseback, adding a unique and romantic component to the traditional beach experience. Tours on horseback often include inland trails and traditional Caribbean lunch as well; giving couples the chance to have an authentic island experience together. Thats more than ssneible! Thats a great post!